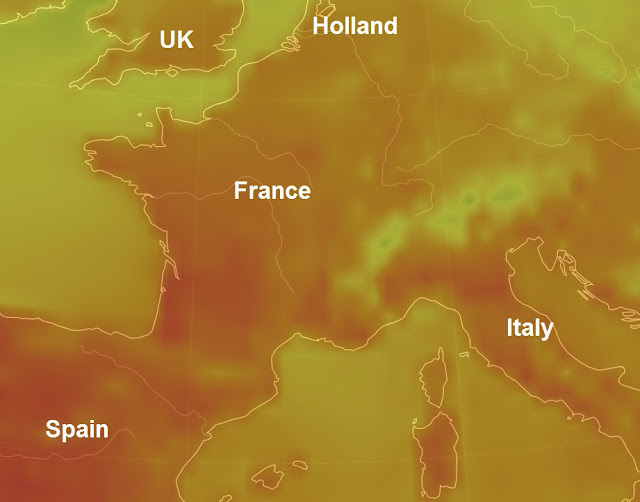 Parts of Europe are on alert as a heatwave moves into position today, parts of France and Spain are expecting some area's to hit 40C (104F) with Holland and Belgium expecting temperatures of 35C. A wave of hot and dry Saharan air over the centre of France has seen seven departments put on 'canicule' heatwave alert today and tonight with temperatures reaching from 35C to 40C and 30C elsewhere, except on the coasts. Météo-France said the heatwave would be short, with the orange alert for the departments of Charente, Indre-et-Loire, Maine-et-Loire, Deux-Sèvres, Vendée, Vienne and Haute-Vienne lasting only until tomorrow morning. However, the forecaster said peaks could reach 40C in Poitou-Charentes before the hot air moves away east across France, towards Ile-de-France, Burgundy and the Rhône valley. The hottest period will be from 14.00 today but high temperatures of up to 35C are expected from tomorrow afternoon with people across the country warned to stay indoors at the daily peaks. Météo-France said the hot weather would continue until at least Wednesday, when cold Atlantic air will force temperatures down. Many communes are making arrangements to check on their oldest inhabitants but for others there are only the usual tips for keeping cool during the day... such as drinking lots of water, washing your face regularly and closing all shutters, windows and curtains on the sunny side of the house. Help is also needed at night as sleeping will be difficult for many with temperatures staying above 25C but eating only a light meal in the evening and even putting your pillow in the fridge for a while may help. A heatwave in 2014 killed thousands in France Holland and the UK.